It’s hard to describe how heavenly this dessert really is. I, for one, happen to love angel food cake with my whole soul. Because it is fat-free, I somehow think of it as The Healthy Cake. The Dessert Where I Can Eat With Abandon and Not Feel Guilty. The Cake Made for Breakfast Eating. The One and Only Cakety-Cake-Cake that Cancels Out Calories and Stimulates Weight Loss. Yeah, I live in a delusional world. This application of angel food cake might just be the best angel food cake dessert I’ve ever had. (Angel food cake, especially this homemade chocolate version with a bit of sweetened whipped cream and strawberries doesn’t count.) It’s fluffy. And creamy. And sweet. And ethereal. It’s a mess of heaven on a plate. With a delightful balance of tart blueberries. *P.S. Of course I’m only kidding. Avocados aren’t a superfood, silly. So here's the deal, it depends on what type of angel food cake you are using to determine how much of it you need. You need about one angel food cake. According to my Aunt Marilyn, a store-bought angel food cake is the perfect size. I made this while my mom was visiting; she made an angel food cake from a cake mix and we used almost all of it in the dessert (minus the amount that exploded in my oven and the pieces we snacked on - so I'd say we used 3/4 of the cake). I'm guessing that my homemade angel food cake recipe would be just about perfect since it is slightly less tall than a cake mix angel food cake. Basically, just keep an eye on the cream/cake mixture — only add cake cubes while they are all evenly coated with a thick layer of cream. Too many cake cubes and it might dry out (especially if it is made in advance). Speaking of making it ahead, this can be assembled and refrigerated up to 24 hours in advance. 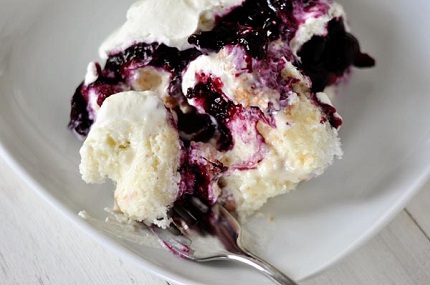 For the blueberry filling, in a medium saucepan, combine the blueberries, sugar, cornstarch, water and lemon juice. Bring the mixture to a simmer and cook until thickened, 5-7 minutes, stirring often. Remove from the heat and let cool to room temperature. For the cake and cream layer, in a blender or with an electric mixer (handheld or stand mixer), whip together the cream cheese, half-and-half or evaporated milk and sugar until smooth and creamy. Transfer the mixture to a bowl if you used a blender. Fold in the angel food cake cubes. Keep in mind (from the note above) that you may not use all the cake cubes, especially if using an angel food cake mix. Add cake cubes until they are all thickly coated with a layer of cream. If making this in advance, it can dry out if there is too much angel food cake added. For the whipped cream, beat together the heavy cream and powdered sugar until peaks form. 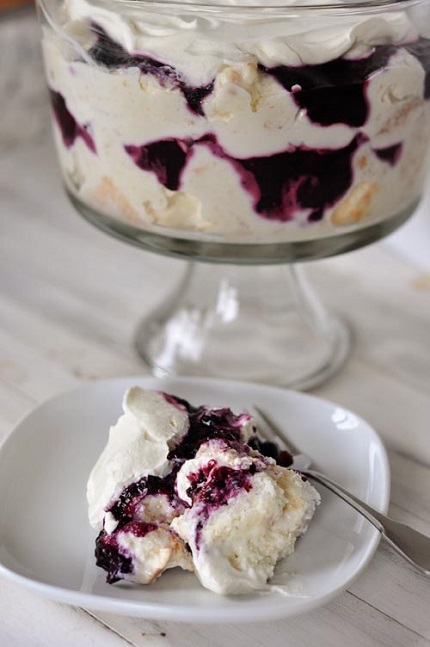 To assemble, in a trifle dish or in a large glass bowl, spread half of the angel food cake mixture. 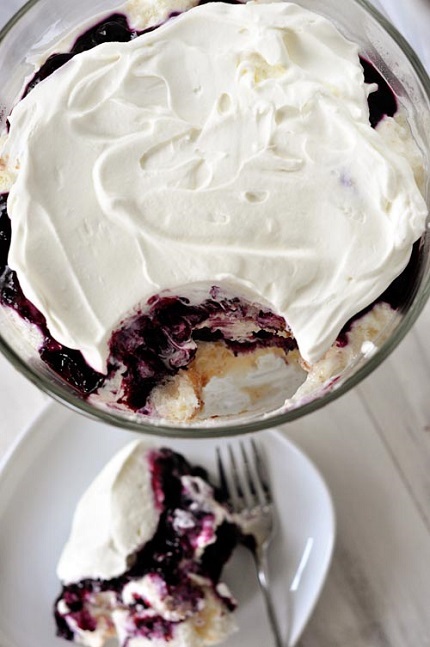 Top with half of the blueberries, spreading evenly across, and then spread half of the sweetened whipped cream. Repeat the layers. Cover and refrigerate at least 2 hours or up to 24 hours. Serve chilled.